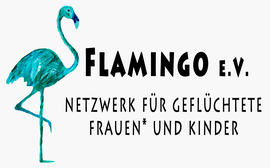 Flamingo e.V. is a non-profit association operating in Berlin to support refugee women* - single, pregnant and/or with children - and unaccompanied minors, irrespective of their origin and residence status. Autonomy, self-determination, social participation and the strengthening of the rights of all refugee women* and children. We have all been active in various fields for years and have experience in political activism, self-organization and support for refugees.